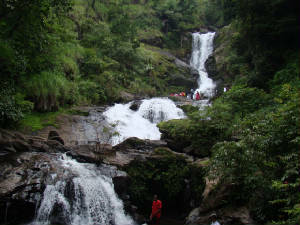 This is an amazing falls located at around 48 km from Virajpet, Coorg District. 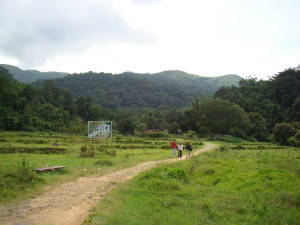 It is around 60km from Bangalore and 120 km from Mysore. Here the river Kaveri falls and here the tributory of Kaveri Lakshmana teertha river starts. A forest trail leads from these falls to the Brahmagiri Peak in Southern Kodagu. It is said thatn when Rama asked Lakshmana to fetch him drinking water, Lakshmana shot an arrow into the Brahmagiri hills and brought into being the river Lakshmana Tirtha. It would be better if you visit the falls at mansoon season or just after that. It is really breathtaking to watch the water splashing from that height. You need to walk a km to reach the falls and the way is not tiresome and you can enjoy. No food is available near the falls.